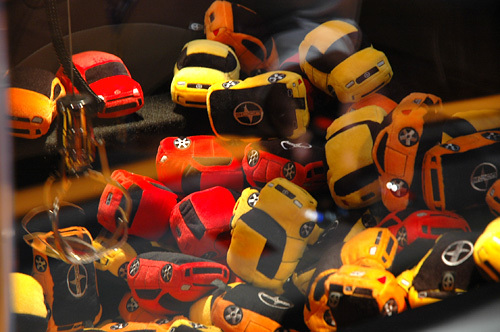 [NAIAS 2008] Scion xD Crane Game Ensures Long Booth Lines | OhGizmo! By Andrew Liszewski on 01/16/08 • Leave a comment! Well I’m finally back from the 2008 North American Auto Show, and after a much needed evening of comatose sleep I’ll try to pump out as many posts as I can. I had hoped to get a few stories written while at the show, but a combination of spotty wifi hotspots and an insanely busy schedule thwarted my efforts. Later in the week I’ll have some longer posts about GM’s announced initiatives, as well as more on the show’s ‘green’ theme. In the meantime though I’ll be posting stuff like this. As a gadget/technology writer walking the floor, you find yourself just as fascinated with the booths as you are with the vehicles. 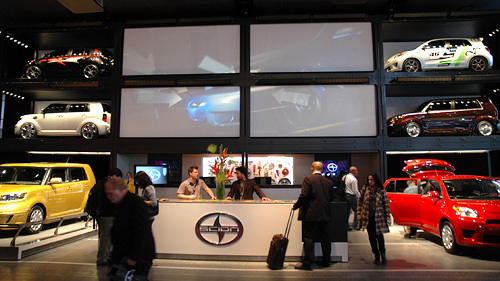 Scion has used this particular booth for the past few years now, but it’s still pretty cool. There’s a wall of vehicles along the back that are selectively covered and revealed by projection screens showing demo reels and other graphics. 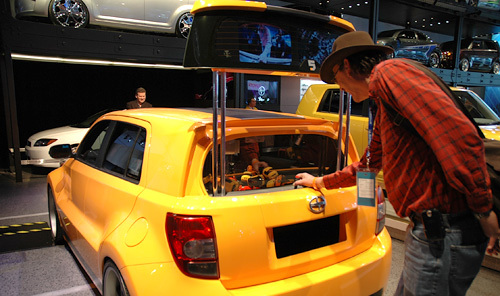 This year though they added a Scion xD that had been converted into a crane game. While the line during the press days was never terribly long, I’m sure when the show opens to the public they’re going to have a ridiculously long queue to deal with. There’s a couple more pics after the jump showing how the game worked, and more importantly what the prize was. 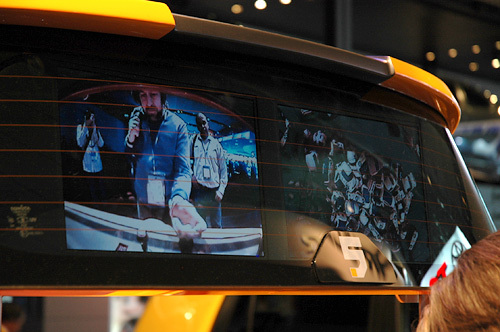 The back window of the xD would actually raise up providing a better view of the inside of the car, and it also had two LCD displays facing outwards. They were both fed by video cameras, with one showing the player as they concentrated on grabbing their prize, and the other provided an overhead view of the 5-axis claw/crane inside. The prize itself was a fairly decent sized plush version of the Scion xD in either red, yellow or orange. It wasn’t that appealing to someone like myself, but for anyone attending with kids at home, it instantly solved the souvenir problem.